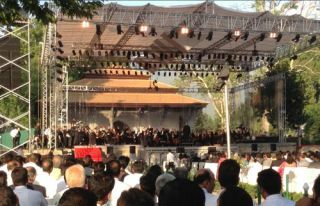 On September 7th, maestro Zubin Mehta and the Bavarian State Orchestra hosted a landmark event known as "Ehsaas-e-Kashmir" (Concert for Kashmir) in the foothills of the Himalayas. The town of Srinagar had not witnessed any official form of cultural activity since a cricket match in 1983, making this one of the most eagerly anticipated concerts in recent times. Nearly 2,000 guests attended the event hosted by the German Embassy in the Shalimar Gardens in Srinagar. Mehta is the Music Director for Life of the Israel Philharmonic Orchestra and main conductor for Valencia's opera house, and it was his lifelong dream to perform in the beauty and serenity of the Shalimar Gardens. The garden is over 500 meters in length with natural waters running through the grounds before feeding into the famous Dal Lake. A nineteenth century Mughal house was chosen as the backdrop, providing many additional challenges with the stage needing to be constructed across many different levels for the orchestra. For sound reinforcement, India's Sound and Light Professionals (SNL Pro) debuted its new L-ACOUSTICS K1 rig for this historic event. The main array only had to cover 65 meters as the concert was for a very select audience. When the final venue layout was decided upon for this event it was sent to System Engineer Bruce Rodericks who used SOUNDVISION to predict the required inventory. Two K1-SB flown on either side in throw mode over six K1, along with two SB28 per side and three pairs of 115XT HiQ as front-fills, were all that was required to achieve an even coverage for the outdoor location. Four LA-RAKs powered the system with three LA8 in each controlled by the LA NETWORK. Jakob Palfrader, the front of house engineer for the Bavarian State Orchestra, was pleased to see the L-ACOUSTICS K1. A last-minute surprise addition to the event was a group of Kashmiri musicians who joined the Bavarian State Orchestra on stage and delivered a fusion performance called Haftrang, which was only rehearsed one day prior to the show.